Ask Us About No Down Payment Loans! 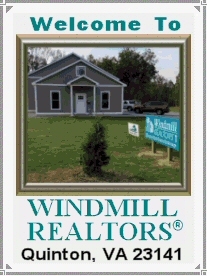 WINDMILL REALTORS® is a full service MLS discount commission real estate brokerage. New Kent real estate listings include rental homes, property management, land, new homes and previously owned homes for sale in New Kent county Virginia, Hanover, Richmond VA, Henrico, King William, Charles City, Quinton and surrounding areas in Virginia.